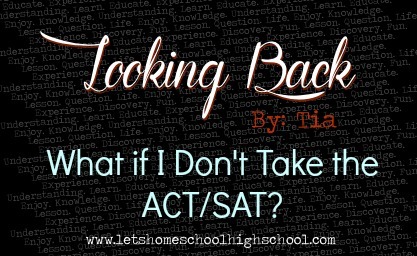 What If I Don’t Take the ACT/SAT? I’m going to let you in on a little secret. When people hear about this, they give me a quizzical look and wonder how this could have ever happened. I never took the ACT or SAT. But how can you get into college without those test scores? If you can’t get into college, how can you possibly do anything other than flip burgers for the rest of your life? (((College alternatives, people. A college education is not the only route for a successful life.))) How can you make your way in life without checking off the “BA degree” box on job applications? While college alternatives and being successful in the work force without a college degree is a completely different (though important) topic, I want to give you a heads-up regarding the ACT/SAT tests and colleges. First, though, some background information. College has never been a serious pursuit of mine. It wasn’t ever something I felt was “for” me, and I haven’t actively pursued it since graduating high school. If you or your student is definitely aimed for college, then please note that I highly recommend taking the ACT/SAT anyway. Many colleges and universities are becoming pickier about their admissions process with homeschoolers, so taking the tests is a GREAT idea. This post is simply about something I learned during high school, and something that has worked for me thus far. Why did I not take the ACT/SAT? I enrolled in college before graduating. That’s it, plain and simple. I discovered in eleventh grade that if I enrolled and became a student at our local community college before graduating high school, I would not need to supply test scores for admission. I still supplied my almost-completed transcript and a couple other documents, but that was about it. Before I knew it, I was an official college student, and I didn’t even have my high school diploma yet. I’ve heard this is pretty common practice for most community colleges, so this should be an option elsewhere as well. Once again, this is just my personal experience. If you are looking at universities, I recommend taking the ACT/SAT. If you want the options of transferring schools, I recommend taking the ACT/SAT. If you just want the security of knowing you have those scores available if need-be, I recommend taking the test(s). We even have a whole category devoted to preparing for either test. I just thought enrolling before high school graduation was a rather neat option for those of us who aren’t as geared toward college as others.